Hidden in the language of Shakespeare's best-loved comedy Much Ado About Nothing, are several clues to an intriguing tale. 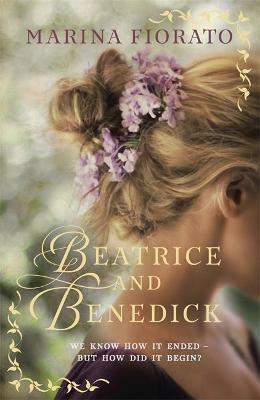 It seems that the witty lovers Beatrice and Benedick had a previous youthful love affair which ended bitterly. But how did they meet, why did they part, and what brought them together again? Messina, Sicily, 1588. Beatrice of Mantua comes to the court of her uncle Leonato, to be companion to his daughter, Hero. That fateful summer, Spanish lordling Don Pedro visits for a month-long sojourn on the island with his regiment. In his company is the young soldier Benedick of Padua. Benedick and Beatrice begin to wage their merry war of wit, which masks the reality that they dance a more serious measure, and the two are soon deeply in love. But the pair are cruelly parted by natural disaster and man-made misunderstanding. Oceans apart, divided by war and slander, Beatrice and Benedick begin their ten-year odyssey back to Messina and each other. In a journey that takes us from sunlit Sicily to the crippled Armada fleet and from ancient superstition to the glorious Renaissance cities of the north, Marina Fiorato tells a story of intrigue, treachery and betrayal that will shed a new light on Shakespeare's most appealing lovers. Marina Fiorato is half-Venetian. She was born in Manchester and raised in the Yorkshire Dales. She is a history graduate of Oxford University and the University of Venice, where she specialized in the study of Shakespeare's plays as an historical source. After university she studied art and since worked as an illustrator, actress and film reviewer. Marina was married on the Grand Canal and lives in north London with her husband, son and daughter. She is the author of five novels: The Glassblower of Murano, The Madonna of the Almonds, The Botticelli Secret, Daughter of Siena and The Venetian Contract and was shortlisted for the Romantic Novelists' Association Historical Fiction Award for Daughter of Siena. You can follow Marina on Twitter at www.twitter.com/marinafiorato and find out more about her and her writing at www.marinafiorato.com.